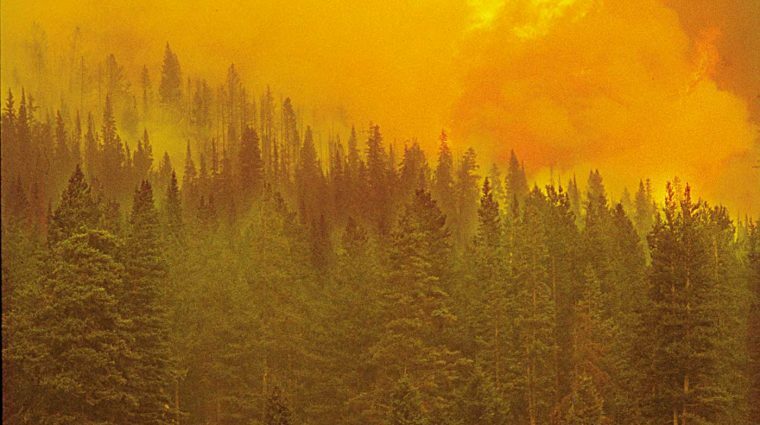 As a result of research conducted after the 1988 Yellowstone Fires, a new fire management plan outlined strict guidelines for managing natural fires and allocated greater funding for fire management. Billings Gazette, James Woodcock. The National Building Museum’s exhibition, Designing for Disaster, examines how we assess risks from natural hazards and how we can create policies, plans, and designs yielding safer, more disaster-resilient communities. Two primary questions help guide the Museum’s approach: Where should we build? How should we build? Through unique objects, captivating graphics, and multimedia—including video testimonials—the exhibition explores new solutions for, and historical responses to, a range of natural hazards, including earthquakes, tornadoes, hurricanes, storm surge, flooding, sea level rise, tsunamis, and wildfires. Designing for Disaster discusses disaster mitigation as an evolving science and highlights the tools and strategies that today’s planners, engineers, designers, emergency managers, scientists, environmentalists, and various business and community leaders are investigating and adopting to build safer, more disaster-resilient communities. Because of the importance of housing, the exhibition features exemplary disaster-resistant residential design. In addition, the exhibition highlights a variety of other building or facilities: hospitals, schools, airports, public arenas/stadiums, fire/police stations, public transportation networks/systems, commercial buildings, and retail outlets. The selected structures are geographically dispersed throughout the country and have been designed to address at least one hazard in an exemplary way. By showcasing innovative research, cutting-edge materials and technologies, and new thinking about how to work with natural systems and the environment, the exhibition presents a range of viable responses that are functional, pragmatic, and beautiful. Science Channel is our exclusive television media partner, and The Washington Post is a media partner.Designing for Disaster is also generously supported by AECOM; Center for Disaster Philanthropy; National Endowment for the Arts; ASSA ABLOY; Construction Specialties, Inc.; National Fire Protection Association; United Technologies Corporation; Federal Emergency Management Agency; Kingdom of The Netherlands; Association of State Floodplain Managers and the Association of State Floodplain Managers Foundation; Florida International University; Nixon Peabody LLP; Rebuild by Design; RenaissanceRe Risk Sciences Foundation; Skidmore, Owings & Merrill LLP; Arup; U.S. Department of Housing and Urban Development; and URS Corporation. Generous in-kind contributions have been provided by Andersen Corporation; Construction Specialties, Inc.; Ernest Maier, Inc.; International Masonry Institute and the International Union of Bricklayers & Allied Craftworkers; Maccaferri; National Concrete Masonry Association; Oyster Recovery Partnership; ReadyReef, Inc.; Simpson Strong-Tie; Star Seismic; Taylor Devices, Inc.